Instagram and ecommerce are logical bedfellows. The brand-audience engagement rates here outperform all of the mainstream social channels, while the visual elegance of Instagram posts are perfect for showcasing people enjoying beautiful products in the wild. It’s lifestyle marketing but without the phoniness of high-concept production shoots – just compelling, evocative imagery wrapped up in authentic social proof. What else could an ecommerce marketer ask for? 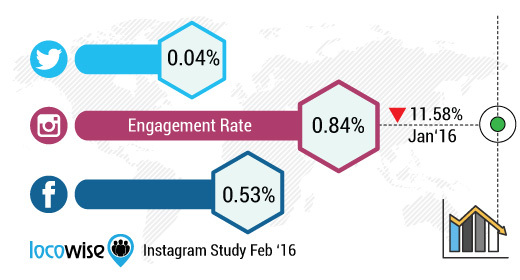 So when it comes to branding and engagement, ecommerce marketers have it great on Instagram. Providing audience members with seamless opportunities to make purchases, however, is another story. Researchers have estimated that 84% of mobile users frequently search for, browse and compare products on their smartphones, so it makes sense that merchants would do everything possible to incorporate Instagram into that experience. In many ways, though, Instagram is a walled garden. Aside from one URL in each user’s bio, nothing is clickable. You can add a “Learn More” button to your posts only if they’re sponsored – organic posts simply don’t support calls-to-action (CTAs). And there isn’t the same developer ecosystem for integrated add-ons like Twitter or Facebook Messenger have, for example. These restrictions have forced ecommerce marketers to get creative. Some brands include product ID codes in post captions, so that shoppers can search for products they’ve seen once they arrive on the merchant’s site. Others favor pay-to-play techniques, foregoing the potential for ongoing organic audience nurturing within Instagram and instead driving traffic to their sites strictly with the aforementioned CTA ads. 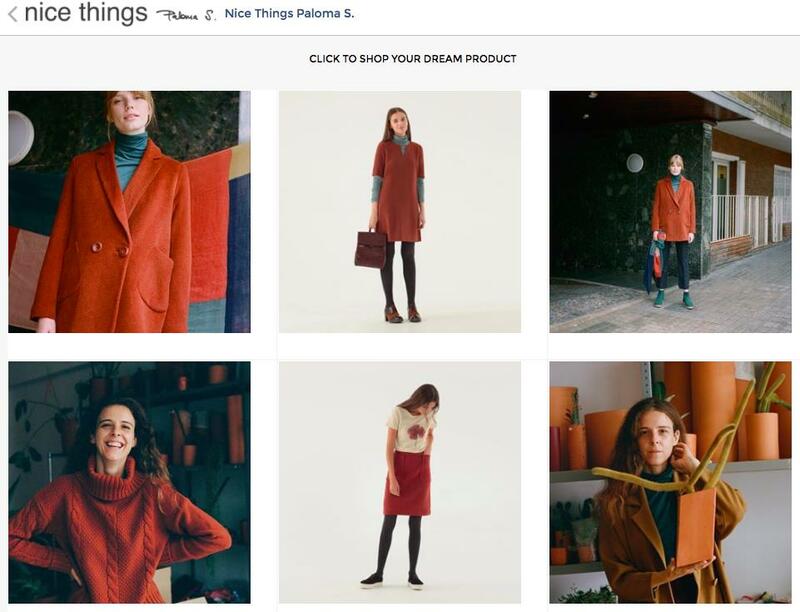 There are now several third-party apps that allow marketers to leverage that one URL opportunity – in the bio – to create shopping experiences that bridge the gap between Instagram and their own stores. (We’ll look at these in closer detail below.) Then there’s the recent announcement, issued earlier this month, that Instagram has begun beta testing its own “shoppable posts” solution. A rollout like this has been inevitable from the outset, but knowing that it’ll likely be available to all accounts by mid-2017 leaves many of us in a state of decision paralysis. So, how about it? Where to start? Let’s drill down and take an in-depth look at some of the best solutions available for making Instagram shoppable. We’ll kick things off with Instagram’s own offering, which began rolling out to 20 select accounts on a beta testing basis earlier this month. Shopping on Instagram allows interested audience members to interact with content, via multiple layers, before making the decision to buy. It’s a great way to pack lots of detail about multiple products into a single post, and the “Shop Now” button creates a direct link between Instagram and merchants’ hosted product pages. Here’s how it works from a user experience perspective. First, your followers see a post featuring products they might be interested in. Selecting a “Tap to View” link brings up product tags – in an interface similar to tagged people in a Facebook photo or pinned locations on a Google Map – capable of displaying bubbles with prices and additional information regarding products. Tapping on the “Shop Now” buttons on each bubble takes shoppers straight to your product page. When you look at Instagram’s shopping feature, it’s clear why Instagram has made linking so awkward in the past. This native feature makes it super-simple for users to browse products without ever leaving the app, making it an ecommerce marketer’s dream. It’s a highly frictionless way for users to buy, and includes the option for businesses to make multiple annotations on an image with direct buy links. 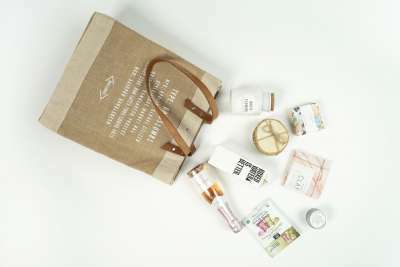 Unlike other solutions on the list here, Instagram’s shopping feature doesn’t rely on users clicking your bio link to access your store and buy products – it’s all right there in the post. As you undoubtedly already know, less friction makes for higher conversion rates. However, in this case, Instagram’s lack of complexity here doesn’t work 100% in its favor. The interface is missing basic must-have ecommerce content elements like star ratings and reviews, which add social proof and can compel buyers. If you’re serious about driving sales with Instagram, then you’re not going to settle for the basic native features. Hot on the heels on Instagram’s own release and just in time for the holiday shopping season, UGC content marketing platform Yotpo has its own offering. 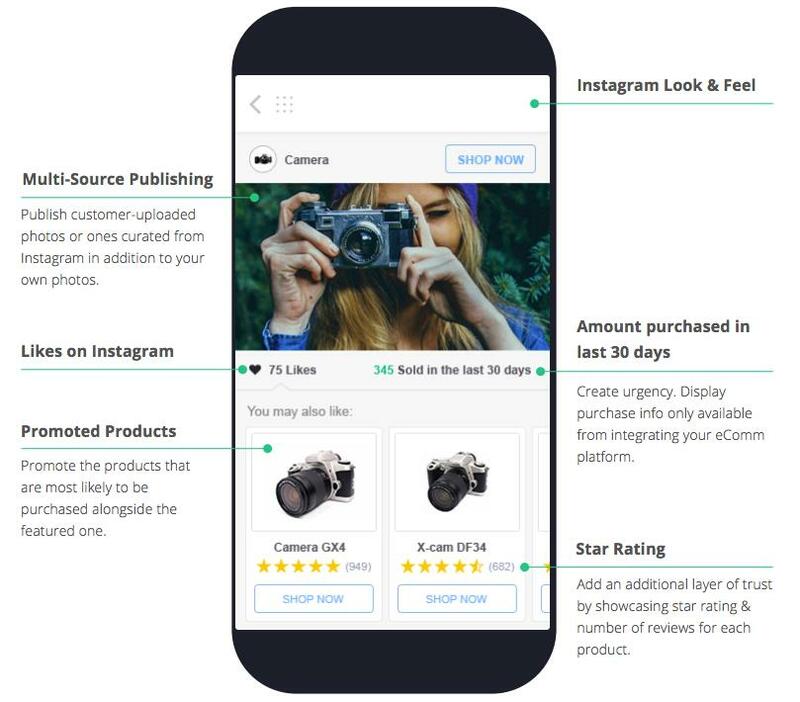 While Instagram’s native feature gives supports a functional (although not yet widely available or particularly appealing) shopping experience, Yotpo’s Shoppable Instagram solution takes it a step further and offers all of the features you expect to see in professional-grade ecommerce environments. 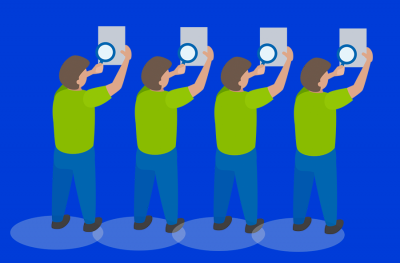 From a UX perspective, here’s how the flow works. When audience members see a product in an Instagram post, they can tap through from a link in your bio to a shoppable interface that mimics Instagram’s design extremely closely and makes it easy to sync with your Instagram account. Most existing solutions require major maintenance on the marketer’s part, to manually replicate the same flow of posts on their Instagram-mimicking shops as their actual Instagram accounts; Yotpo’s solution makes the setup process far smoother. Once shoppers are on the Yotpo-powered version of your Instagram post, the social proof elements can really make a difference. Each tagged product is accompanied by plenty of affirming information about the products, along with calls-to-action to tap through to product pages. Once your Instagram follower is on your own site, the Instagram-flavored social proof continues seamlessly, with a beautiful slider widget displaying Yotpo’s verified customer reviews, ratings, curated customer Instagram posts and your own visual marketing assets to increase page stickiness and the chances of closing the sale. While Instagram’s own option is great for layering detailed information about several products into a single post, it’s an isolated experience. By that, I mean that once you’ve browsed and shopped, there isn’t really any way to show other people that you’ve found something great. With Yotpo, the shoppable post becomes a social experience as well. As customizable as Yotpo is, if you’re not on the ball enough to really take advantage of all of its features, you might not get the full effect. That said, it is an awesome solution, and like any marketing tool, the best thing to do is to practice with it and test the sales boost that it provides you with. Since Instagram allows one link per profile and Curalate’s Like2Buy isn’t an official Instagram product with access to the app itself, you put the link Like2Buy generates in your bio as a catch-all for every product you want to promote in your posts. Oftentimes, there’s a disconnect between people seeing a product they like on Instagram and then actually finding it on your site and buying it. This is completely understandable, given that in most cases, they’re expected to copy and paste a link from the app to a browser – or worse, to search for the product once they’re on your site. The likelihood of people actually doing so decreases with every additional inconvenient step. Like2Buy turns the Instagram window shopping experience into an actual shopping experience. 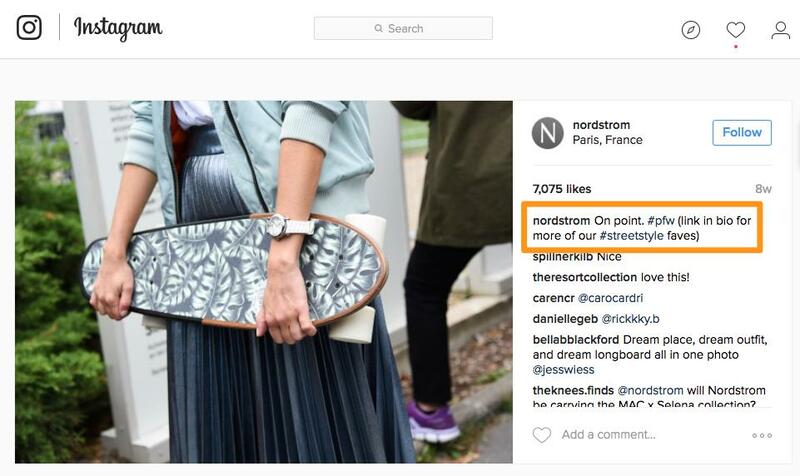 And, as you’ll notice if you follow this link, the Like2Buy interface more or less replicates Nordstrom’s Instagram feed, but when you click the images, you can choose which products from the post you want to buy. From there, you’re directed to Nordstrom’s website. Putting products behind two further layers isn’t the most elegant solution, but it definitely beats updating your bio link every time you post something new. Like2Buy is great because it makes shopping via Instagram seamless. People can go straight from a piece of content with a tagged product in it, to the merchant’s site to buy. 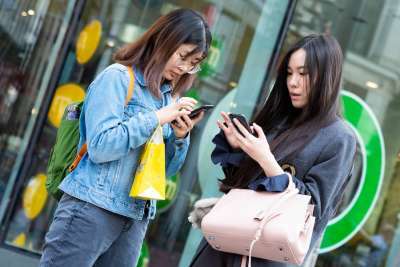 Plus, according to Like2Buy’s own data, Like2Buy-referred users spend 32% more time browsing merchant’s sites, than those who find the site organically. Make sure that what you’re tagging and advertising on Instagram is the same as what site visitors see when they click through. Not doing so violates their trust, increases the chances of confusion and could damage your reputation. This may sound obvious, but it happens a lot. Foursixty integrates with your Instagram account to generate an embeddable grid of posts that looks just like Instagram’s interface. While browsing the embedded gallery on your site, shoppers can click on any image that features a product they like, and they’ll be taken straight to the relevant product page. This gives people a new method of product discovery that’s more compelling than your usual list of items because it’s framed in the context of Instagram photos. In addition to your own posts, Foursixty lets you curate user-generated content from the broader community of Instagram users – and to accept or reject submissions. This puts you in total control of your brand image, it gives you the chance to showcase happy customers, and it allows you to hand off chunks of your content creation workload to your customers! Something worth noting here is that the product discovery doesn’t take place on Instagram with this tool. Instead, Instagram’s connection with your products is displayed on your site. Basically, it’s an ecommerce-oriented solution for Instagram scheduling and analytics as well as a way to curate Instagram posts on your site as embeds that are associated with product pages. Other tools – Yotpo, for example – can do this for you along with additional functionality. One thing that FourSixty does have going for it, though, is that it’s perhaps the most developer-friendly option on this list, as it allows marketers to customize the layout and style of shoppable posts. FourSixty also offers a Google Analytics integration that allows marketers to see which pieces of content are performing the best. This data is also displayed in FourSixty’s own dashboard interface. Photoslurp is another viable but unsophisticated option for adding shoppable posts to your Instagram feed. This tool allows the seller to create shoppable gallery links and allows users to browse featured products and click to buy. What makes Photoslurp different from the others is the way that it identifies images of your products and adds them to a queue for your evaluation and approval. For example, if someone posts a picture on Tumblr of himself or herself wearing a sweater you make, then assuming that the post fits your brand image, you can create a shoppable version of the post. From there, it’s just a matter of waiting and tracking the conversions. It works well because customers are interested in seeing people like them using your products – not flawless models or other unrealistic contexts. Photoslurp may not be the most advanced Instagram ecommerce option, but for what it offers, it does it well. You do have to add a link to your bio, which slightly decreases the likelihood of users finding your gallery, but almost all of these solutions use the same flawed solution. Once people click through, they’re greeted by all of your featured products, plus user-generated content, including real-world photos of people using your products. The main challenge here is getting users to visit your shoppable gallery in the first place. Make sure your content is top-quality, so as to minimize drop-offs along the funnel. Instagram is the ecommerce marketer’s best friend, but its potential is wasted if you’re just rotating products in and out of your bio link. All of these apps are great at what they do, and each one offers a reasonably usable way for users to shop directly through Instagram. They all solve the extremely basic problem of potential customers not following through on their intent to purchase simply because there’s no clear route from what they’ve seen to where they can buy. In essence, these tools turn Instagram’s window shopping experience into a legitimate, revenue-rich ecommerce opportunity, and no matter the size of your business, using them is likely enough to be both simple and worthwhile. Only using static bio links right now? Try one of these tools today, and get ready to see a huge impact on your sales this holiday season.